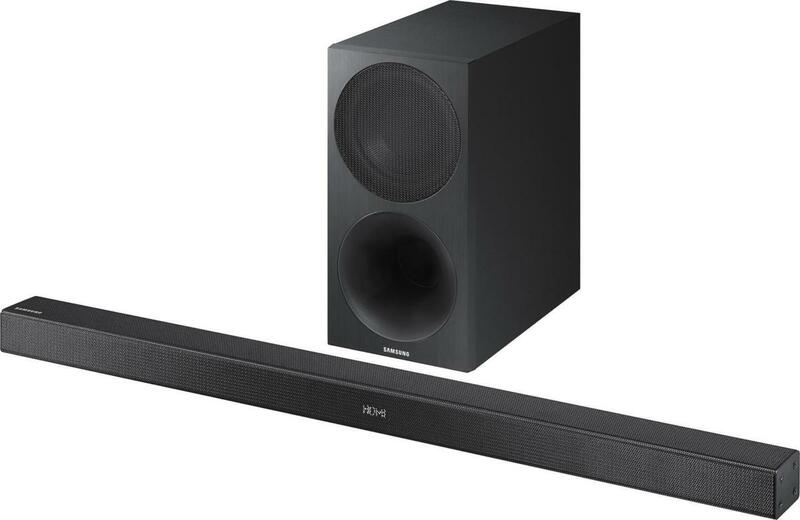 An included wireless subwoofer and the ability to add wireless surround speakers tops the list of features you'll find in this entry-level soundbar. 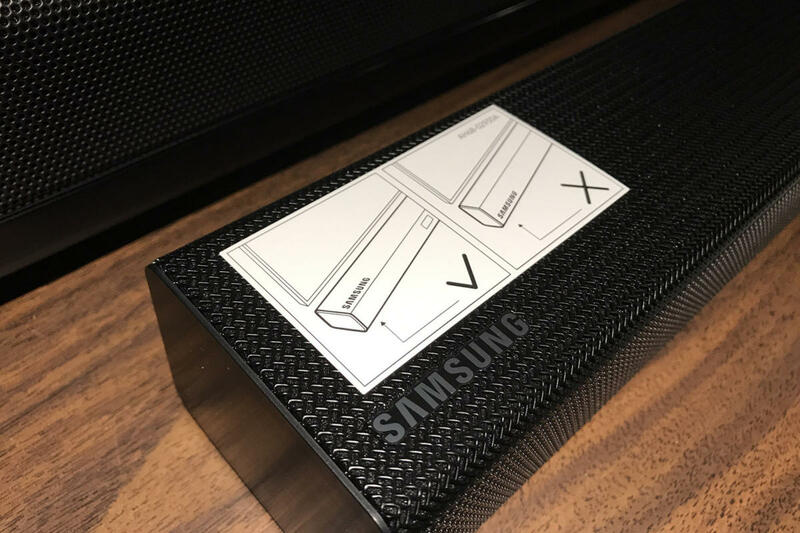 The generic name Samsung slapped on this budget soundbar’s box is diametrically opposed to the value of what’s inside the box: The 2017 Soundbar w/Wireless Subwoofer (model HW-M450) delivers more features than I thought was possible for $280. This is a 2.1-channel soundbar with an 80-watt amplifier powering four drivers in the soundbar, and a 160-watt amp driving a 7-inch wireless subwoofer. The soundbar itself keeps a low profile, measuring 35 7/8 inches wide x 2 1/16 inches tall x 2 7/8 inches deep. You can install the soundbar on top of a cabinet, inside a cabinet, or mount it to the wall with the provided hardware. The Samsung HW-M450’s design looks counter-intuitive, however, and I’m sure you’ll do the same double-take I did when you open it. The drivers sit on the face of the shorter, not the taller side of the enclosure. So the HW-M450 is designed to hang on the wall or on a cabinet with its long side facing out and the Samsung logo facing up. 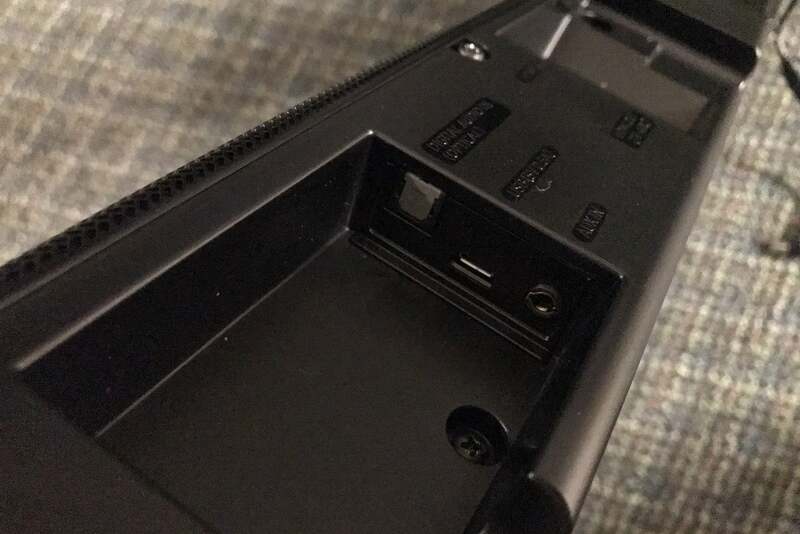 A sticker on the soundbar’s face warns against installing the speaker in the wrong orientation. The included wireless subwoofer is a front-ported design with a tall skinny cabinet that reduces its overall footprint, making installation simpler if you have limited free floorspace. Pairing was instantaneous. As soon as I plugged in the soundbar and subwoofer, the pairing was complete. There was nothing more that I needed to do. Should you run into a problem, Samsung provides the means to pair the subwoofer manually. Samsung includes a wireless subwoofer with a tall, thin profile that makes it easy to place in your room. You use the remote control to adjust the subwoofer’s volume from a range of -6 to +6, but there’s also a -12 setting, for situations where the music or movie soundtrack is incredibly boomy (or you need to lower the bass to keep the peace with your neighbors). The HW-M450’s wireless subwoofer did a nice job of providing low-frequency output. Explosions and other dynamic soundtrack elements had good impact. In my room, I appreciated the fact that the midbass never got boomy. But for whatever reason, I found this subwoofer to be extremely finicky with placement. I had a tough time getting the subwoofer to blend perfectly with the soundbar. And if you decide to add a better subwoofer down the road, you’ll be out of luck—there is no preamp subwoofer output on the soundbar. Connectivity options abound: HDMI, Toslink, USB, 3.5mm analog, and Bluetooth wireless sources are all available. The one option that’s not: Wi-Fi. That means you won’t be able to stream from a DLNA server on your network or a streaming service such as Spotify—unless you use your mobile device and stream to the soundbar via Bluetooth. Detail view of Samsung’s inputs. 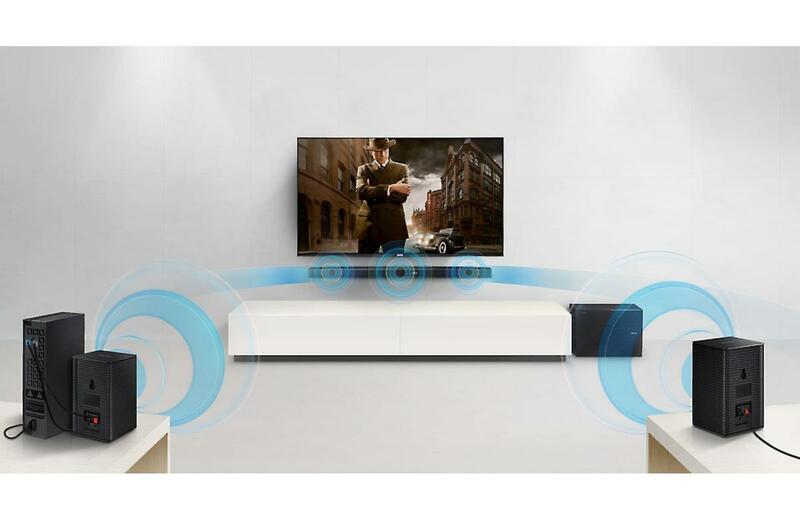 And in addition to connecting to your TV wirelessly, Bluetooth connectivity takes on a whole new level of awesome through a special feature the HW-M450 offers. Purchase Samsung’s optional SWA-8500S wireless speaker kit ($130), and you can add left and right surround speakers to experience true surround sound without any wires. Samsung’s kit has lots of other smart extras as well. You can set the soundbar to turn on automatically when it senses a signal. If you use HDMI with CEC, you can even synchronize the soundbar to power on and off with your TV. CEC, which stands for Consumer Electronics Control, enables consumer-electronics devices to communicate with each other over HDMI (it was first defined in the HDMI 1.0 standard and has been updated several times since then). The soundbar’s HDMI out also supports ARC (Audio Return Channel), so that the TV it’s connected to can send its audio programming back over the HDMI cable. This eliminates cable clutter and is particuarly important if you intend to use the TV’s onboard tuner or its smart TV features to stream Netflix and other services. 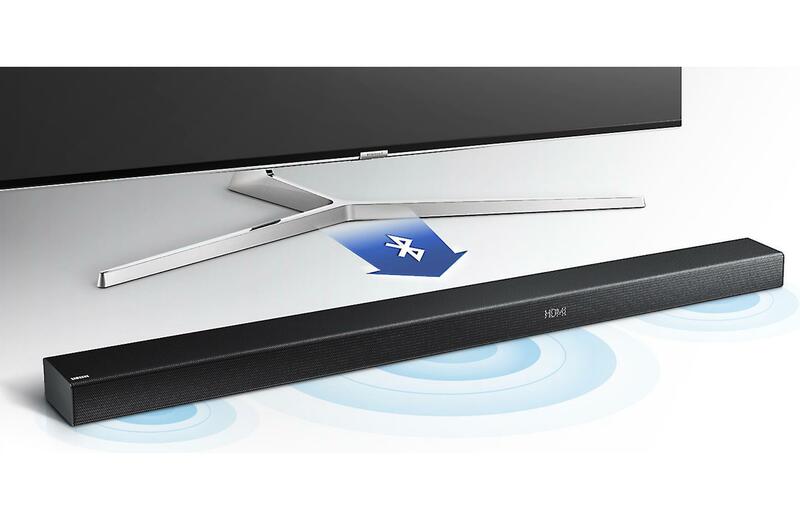 Adding Samsung’s optional SWA-8500S wireless speaker kit lets you add right and left surround speakers wirelessly. Samsung offers a handful of DSP modes with this soundbar: Standard, music, sports, and movie will be familiar to most, but anl option called Clear Voice can help make dialog more intelligible. I’m generally not a fan of using lots of audio digital signal processing, but I found that the movie setting sounded the best in my room. It provided the best balance between dialog intelligibility and dynamics—even if it bloated the midrange frequencies a bit. I’ll talk about my impressions of Clear Voice further down in the review. Samsung’s remote has an additional “surround” mode, too. Push the button and you’ll get an additional sense of depth and space from the audio signal, and you can apply on top of any of the aforementioned modes. Just don’t expect it to do magic. This is a two-channel soundbar, and no amount of digital signal processing magic will be able to match the capabilities of a genuine multi-channel audio system. You can connect the Samsung soundbar to your TV wirelessly, via Bluetooth, if your TV supports it. Samsung’s remote control is surprisingly excellent for this price range. Instead of dropping a cheap credit card-sized remote in the box and calling it a day, Samsung developed an elegant, easy to hold, simple remote that looks for all the world as if it were designed in Cupertino. There are independent switches for both the main volume and the sub. The volume controls are elevated toggle switches, not buttons. Pushing the switch up or down adjusts the volume accordingly. Holding the switch down mutes the soundbar. The same is true for the subwoofer switch, except that holding it down resets the sub’s volume to zero gain, the system default. 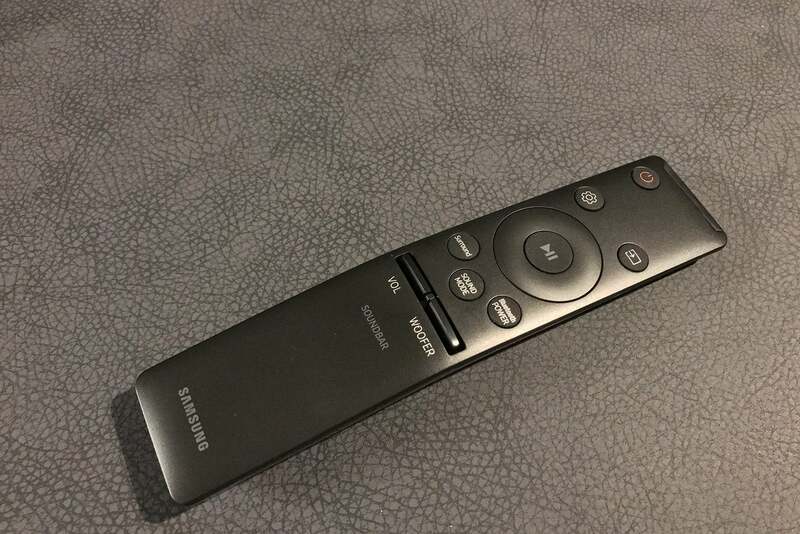 Samsung includes an excellent remote control with the HS-M450. My only beef with the remote is that there isn’t a dedicated button for activating Clear Voice. You need to scroll through each surround mode to select the one that you want. That’s an oversight Samsung should correct in next year’s model. Many people purchase soundbars to improve dialog intelligibility. The last thing you want to do while watching a movie or TV show is fumble through surround modes to get what you want. To compound the problem the soundbar mutes as you’re scrolling, which means you won’t hear any dialog. The front status display is big, clear, and easy-to-read from several feet away. It will show you the status of the button your are pressing on the remote. Generally speaking, Clear Voice did a very good job of lifting dialog out from whatever scene I played. But Clear Voice also had two ill effects: dynamics suffered, and voices sounded unnatural. Clear Voice noticeably reduced the dynamic range in Rogue One: A Star Wars Story when Rebel Alliance X-Wing fighters conduct a sneak attack on the imperial outpost on Eadu. Blaster shots and explosions during the assault were drained of their energy. There was a noticeable difference between playing this scene in standard mode versus Clear Voice. Clear Voice just doesn’t sound natural. It’s especially noticeable if a character raises their voice or yells. For example when Jyn Erso screams out “Father!” the moment the X-Wing fighters begin their attack on the Imperial research facility at Eadu. Jyn’s scream sounds unnatural and muffled. But at least you can hear what she said! This soundbar is ideal in small to medium rooms, but I’m sure you won’t be surprised to hear that it doesn’t deliver enough oomph for larger spaces. 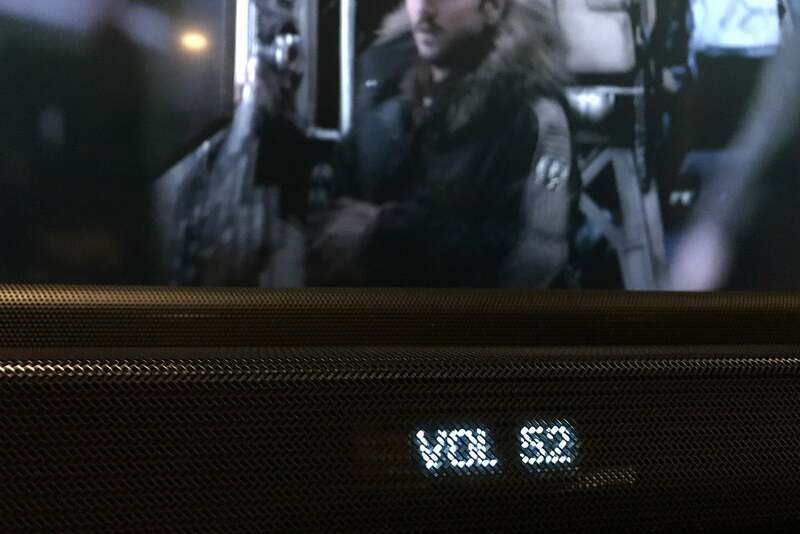 In my 13 x 24-foot home theater space (which is also open to the rest of my basement) I had to crank the volume into the 80s and sometimes 90’s (out of a max of 100) to get the Samsung HW-M450 to a satisfying volume level. Even at full volume, it never got to ear-deafeningly loud. Samsung’s HW-M450 soundbar sports a wonderfully thin profile, on-board HDMI, a clear display, and a stylish and intuitive remote control. Its wireless subwoofer is a plus and pairing was flawless. The ability to add wireless surround speakers for a true surround-sound experience is a big differentiator. Unfortunately its overall sonic performance is just middle of the road. While the HW-M450’s Clear Voice technology makes dialog more intelligible, it creates other sonic issues that some consumers might not care for—at least not with entertainment content. If you’re looking for the best sonic performance in this price range, then you should look elsewhere. 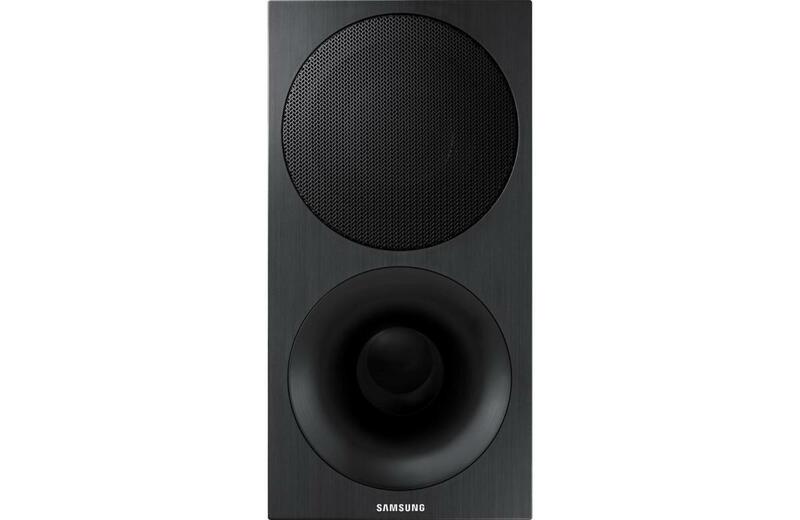 But if you have a small to mid-sized room and you want a feature-rich package that other products in this price-range can’t match, then you should give the Samsung HW-M450 a serious listen. This soundbar and wireless subwoofer combo boast some eye-popping features (and expansion opportunities) for the price tag.